Dr. Daniel J. Siegel on what makes mindfulness beneficial to our health, psyche, and overall quality of life. The practice of intentional, nonjudgmental awareness of moment-to-moment experience has been practiced since ancient times in both East and West. Wisdom traditions have for thousands of years recommended mindful practice in a variety of forms to cultivate well-being in an individual’s life. Now science is confirming these benefits. Here, we’ll explore the common elements of these practices and review the research findings which affirm that daily mindfulness practice is good for your health. We’ll then explore a new field called interpersonal neurobiology that integrates a wide range of sciences and other ways of knowing about reality into a common language that illuminates the subjective world of the human mind. Mindful awareness practices include yoga, tai chi, qigong, centering prayer, chanting, and mindfulness meditation derived from Buddhist tradition. The science of mindfulness could have delved into any of the practices of intentionally focusing on the present moment without judgment, but through the impact of the Buddhist-inspired program of Mindfulness-Based Stress Reduction, much of our in-depth research on the impact of mindful awareness on brain and immune function, as well as psychological and interpersonal changes, has emerged from the study of mindfulness meditation. Jon Kabat-Zinn, a microbiology Ph.D. then teaching at the University of Massachusetts Medical Center, was inspired in the late 1970s to apply the basic principles of mindfulness meditation to patients in a medical setting. His work developing the MBSR program proved effective in helping alleviate the suffering of chronic and previously debilitating medical conditions such as chronic pain. It also served as fertile ground for a systematic set of research investigations in collaboration with one of the founders of the field of affective neuroscience, Richard Davidson of the University of Wisconsin at Madison. Kabat-Zinn repeatedly clarifies in his writings and teachings that MBSR, despite its Buddhist roots, is a secular application of mindfulness, which is a practice of carefully focusing attention, not a form of religion. Indeed, each of the mindfulness practices mentioned above share common, secular elements: cultivating an awareness of awareness and paying attention to intention. Studies show that the ways we intentionally shape our internal focus of attention in mindfulness practice induces a state of brain activation during the practice. With repetition, an intentionally created state can become an enduring trait of the individual as reflected in long-term changes in brain function and structure. This is a fundamental property of neuroplasticity—how the brain changes in response to experience. Here, the experience is the focus of attention in a particular manner. A question that is raised regarding the specific features of MBSR is what is the “active ingredient” in its powerful effects. Naturally, the experience of joining with others to reflect on life’s stresses, listen to poetry, and do yoga may each contribute to the program’s scientifically proven effectiveness. But what specific role does meditation itself play in the positive outcomes of the MBSR program? One clue is that those practicing mindfulness meditation during light-treatment for psoriasis revealed four times the speed of healing for the chronic skin condition. And in other studies, long-term improvements were seen and maintained in proportion to the formal reflective meditation time carried out at home in their daily practice. Further research will be needed to verify the repeated studies affirming that long-term improvements are correlated with the mindfulness apractice, and are not just the effect of gathering in a reflective way as a group. Sara Lazar and her colleagues at Massachusetts General Hospital have found that people who have been mindfulness meditators for several decades have structural features in their brains that are proportional to their number of hours of practice. But this finding, too, along with studies of “adepts”—those who have spent often tens of thousands of hours meditating—need to be interpreted with caution as to cause and effect. Are those with differing brain activity and structure simply those who’ve chosen to meditate, or has the meditation actually changed their brains? These questions remain open and in need of further studies. First, a “left-shift” has been noted in which the left frontal activity of the brain is enhanced following MBSR training. This electrical change in brain function is thought to reflect the cultivation of an “approach state,” in which we move toward, rather than away from, a challenging external situation or internal mental function such as a thought, feeling, or memory. Naturally, such an approach state can be seen as the neural basis for resilience. Second, the degree of this left-shift is proportional to the improvement seen in immune function. Our mind not only finds resilience, but our body’s ability to fight infection is improved. At the University of California, Los Angeles, David Cresswell and his colleagues have found that MBSR improves immune function even in those with HIV. Improved immune system function may help explain the increase in healing found in the psoriasis treatment studies with mindful reflection during treatment. Third, MBSR studies reveal that patients feel an internal sense of stability and clarity. Using a modified version of a general MBSR approach in our own pilot study at the UCLA Mindful Awareness Research Center, we’ve found that adults and adolescents with attentional problems achieved more executive function improvements (sustaining attention, diminishing distractibility) than are accomplished with medications for this condition. Other researchers (Alan Wallace, Richie Davidson, Amiji Jha) have also found significant improvements in attentional regulation in those who have had mindfulness meditation training, such as enhanced focus as revealed in the reduction of the “attentional blink,” or times when new information is not seen because of prolonged attention on the prior stimulus. Some of these studies have been done during three-month retreats with the primary focus on isolated meditative practice rather than group discussions. 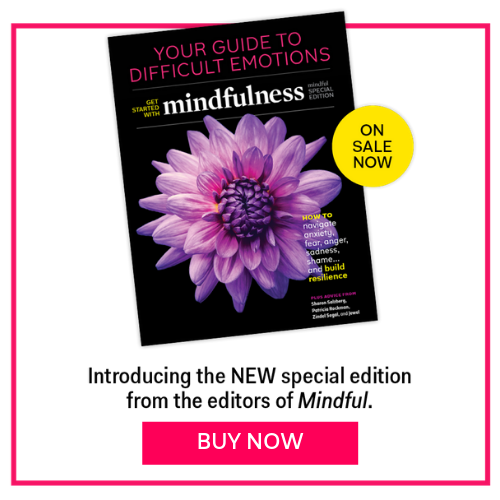 Fourth, researchers in a wide array of mental health situations have found that adding mindfulness as a fundamental part of their treatment strategies has proven to be essential in treating conditions such as obsessive compulsive disorder, borderline personality disorder, and drug addiction, and is also helpful in the prevention of chronically relapsing depression. Some insight into the possible core mechanisms that enable application to the treatment of a wide range of mental disorders was offered in a recent study by Norman Farb and colleagues in Toronto. After just the eight-week MBSR program, subjects were able to alter their brain function in a way that confirmed they could distinguish the “narrative chatter” of their baseline states from the ongoing sensory flow of here-and-now experience. This ability to develop discernment—to differentiate our unique streams of awareness—may be a crucial step for disentangling our minds from ruminative thoughts, repetitive destructive emotions, and impulsive and addictive behaviors. Finally, studies of mindfulness-based programs have revealed that medical students experienced improved empathy and physicians had decreased burnout and enhanced attitudes to their patients. How do we make sense of this science of mindfulness? Here is a brief foray into the emergence of an independent way of knowing called interpersonal neurobiology. At the same time as Jon Kabat-Zinn was creating the MBSR program some thirty years ago, I was starting medical school just a few miles east in Boston. Discouraged by the lack of empathy in my professors and the way patients—and students—were treated as physical objects seemingly devoid of an internal world, I stopped school to wrestle with this widespread blindness to the inner reality of the mind. When I ultimately returned to finish my degree, what became clear to me was that there were two fundamental ways people could see reality. One was through a lens of the physical, the other through a lens of the mind. Many of my teachers in medicine had honed the physical lens—seeing the subtle signs and symptoms of physiological disease. This was an important, but incomplete, aspect of being a healer. I came to realize that these professors lacked the development of the lens that enabled them to see the mind’s feelings or thoughts, its hopes or dreams. Recent scientific findings on the benefits of practicing mindfulness. University of New Mexico researchers found that participation in a Mindfulness-Based Stress Reduction course decreased anxiety and binge eating. Office workers who practiced MBSR for twenty minutes a day reported an average 11% reduction in perceived stress. Eight weeks of MBSR resulted in an improvement in the immune profiles of people with breast or prostate cancer, which corresponded with decreased depressive symptoms. A prison offering Vipassana meditation training for inmates found that those who completed the course showed lower levels of drug use, greater optimism, and better self-control, which could reduce recidivism. Fifth-grade girls who did a ten-week program of yoga and other mindfulness practices were more satisfied with their bodies and less preoccupied with weight. A mix of cancer patients who tried MBSR showed significant improvement in mood and reduced stress. These results were maintained at a checkup six months later. The likelihood of recurrence for patients who had experienced three or more bouts of depression was reduced by half through Mindfulness-Based Cognitive Therapy, an offshoot of MBSR. After fifteen weeks of practicing MBSR, counseling students reported improved physical and emotional well-being, and a positive effect on their counseling skills and therapeutic relationships.